SILK-EFFECT WHITE LACQUER Silk-effect white doors. Etched tempered glass doors. Bronze finish Etoile handle. Bookcase with slatted back panel in natural knotted oak; 4-cm thick, silk-effect, white lacquered shelves. Etoile table in silk-effect white lacquer. Etoile chairs covered with ecru cotton. 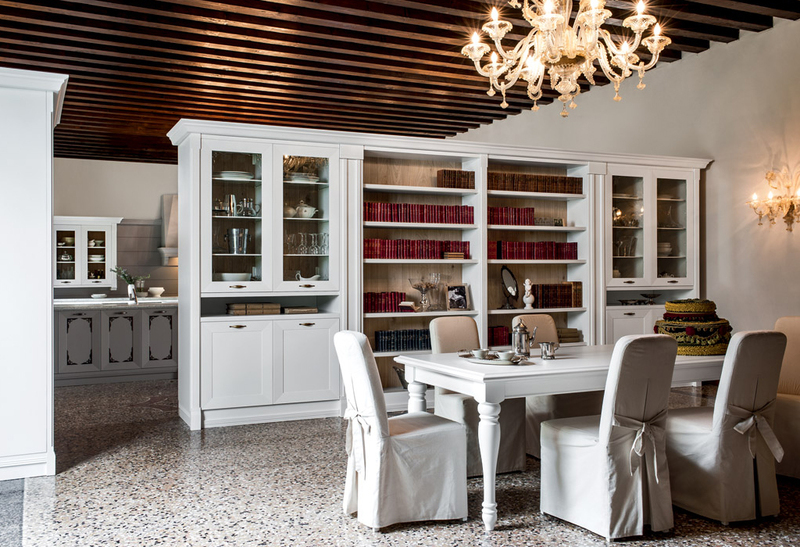 The warm and cosy atmosphere of Etoile extends to the dining and living rooms, elegantly furnished with display units and bookcases. The same care over detail can be found again here: the front edges of the shelves are fluted like the vertical pilasters. The slatted back panels of the bookcases and of the glass display units are in natural knotted oak: a textured finish that creates an original and pleasant contrast with delicate silk-effect lacquer. The slightly projecting pilaster bases mark the pace of the various furnishing elements while setting them off and giving them more character. The Etoile table harmoniously completes this arrangement with its moulded edge and turned legs. It is shown here with chairs covered with ecru cotton.